I don't have anything great to post tonight because I just made my 30-20-10 Chicken Wings (teriyaki style), tots and a salad for the kids. Very basic and tasty, but not worth a repeat. We never know how many "kids" we are going to have from night to night. For example, Saturday we had Trevor (10) and his friends Jack , Olivia and Wrin. Tonight we had Trevor and Brett (21), his girlfriend, and his friend Eric. Sometimes, it's just Alexis and me. Our "family" fluctuates between 2 and 7 on any given night. It can really be aggravating trying to deal with it, but I'll be honest with you. It keeps us young. Or "youngish". I know the "kids" will be gone before long so when I get frustrated, I just try to remember someday I'll be wishing that they were around more. So anyway. 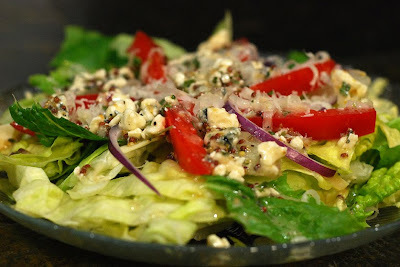 Here's a quick easy vinaigrette I made the other night for the salad I made to go with our steaks and Spinach Maria. I imported it in 2005 from Southern Living into my BigOven software "to try" and just got around to doing it this weekend. It quickly earned our "favorite" status! If you like blue cheese, you'll love this. If you don't? You'll hate it. Alexis and I both loved it. It reminded us of Brianna's Blue Cheese dressing back before they changed it. So it took me over 4 years with this in my "try soon" queue before I actually made this. Do you hold onto recipes in limbo that long or is it just me?